Nutrition experts like to portray weight control as a simple matter of “calories in minus calories out.” But as anyone who’s ever been on a diet knows all too well, it isn’t quite that easy! There are many factors that affect weight, such as genetics, metabolic rate, weather, and even breed. Ultimately, the only ones we humans can control for our pets are diet and exercise—so let’s see why and how to manage our pets’ weight. Unfortunately, overweight has become the norm for our dogs and cats. In fact, many people would consider the “ideal” body condition as too thin. Yet research has shown that dogs live longer–significantly longer–if they’re kept slightly underweight. A long-term study done by Purina looked at the difference in lifespan between Labrador Retrievers who were kept slimmer versus normal Labs (who were fed according to Purina’s own directions for that food!). The dogs who were fed less lived TWO years longer, and and the onset of degenerative diseases such as arthritis was significantly delayed. Overweight pets’ lives, health, and comfort are damaged even more. Other research has shown that, in both cats and dogs, feeding a high-protein, low-carbohydrate diet results in healthier weight loss and better muscle mass retention than high-fiber “weight loss” diets. This makes perfect sense when we consider that our dogs’ and cats’ ancestors—and their current cousins—are designed to eat prey animals that are just that: high in protein, relatively high in fat, and very low in carbohydrates. Canned, raw, or properly balanced homemade diets are ideal for both dogs and cats; and are especially important for cats, who need the extra moisture and high protein for urinary health. Dry food is not recommended for cats, period. “Light” and “weight control” diets tend to be lower in fat and protein, and higher in fiber and carbohydrates, than comparable regular foods. But this is taking the nutritional balance in the exact opposite direction from the natural high-protein, low-carb carnivore diet our pets were designed to eat. If the amount of “light” food being fed is not restricted, most pets will gain weight on that food. Carb-based diets just aren’t satisfying to the canine and feline palate, so pets will eat more of the food to get more of what they want and need. Moreover, a recent study showed tremendous variation in the amount of calories in different brands of “light” foods–some were higher in calories than other brands’ regular foods! If your pet is a treat junky, there are things you can do to moderate the number of treat calories your dog or cat is getting without making your pet (or you!) feel deprived. For larger treats, break them into smaller pieces. Your pet will quickly adjust to the new size and feel just as satisfied. Give a lower calorie treat; or try treats made from dehydrated chicken or other meat that add primarily protein and little or no carbs. Limit rawhide bones, marrow bones, and other “chew” treats; many of them are very high in fat and will load a huge amount of calories to your pet’s daily intake.To your pet, it’s more about the attention and love from you that your companion associates with treats, than about the treat itself. Whatever treats or “shared” food your pet gets,you need to deduct treat calories from meals to balance the day’s total. Yes, that means the meal needs to be smaller! Unfortunately, counting calories is the best way to understand what we’re feeding our cats and dogs. Happily for those of us who recoil at math, it’s much easier for our pets than for people, who need to know calorie counts in a huge variety of food. Most of the time, we’ll be dealing with just a few foods and treats. *What we commonly refer to as a “calorie” is technically a kilocalorie, or kcal. There may be little or no difference between regular and “diet” foods. Calorie information is not yet required to be on the label, although some makers provide it. Calorie information will be required on pet food labels starting in 2014 for new products, with a phase-in period for currently marketed products. For now, check the manufacturer’s website or call for calorie info on each particular food or treat. 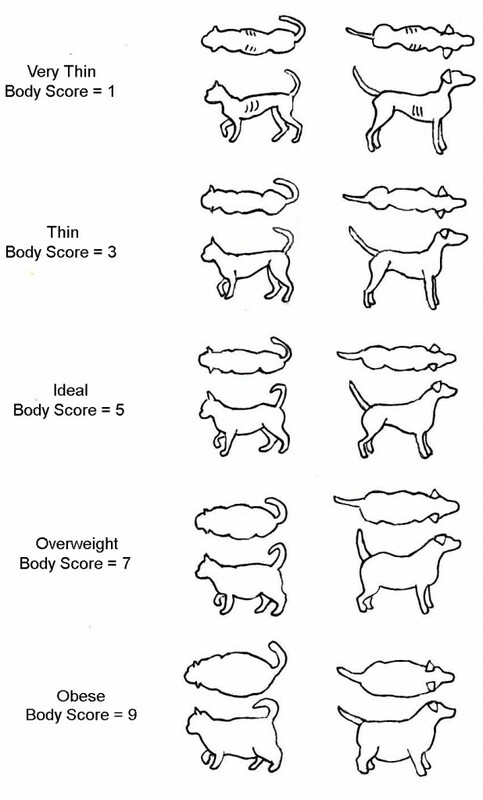 Your pet is estimated at _______ on the Body Condition Score Chart on the right. The ideal BCS for disease prevention and longevity is 4 to 4.5. With this in hand, along with calorie information for the food and treats you feed your pet, you can calculate how much food to feed. Fluffy weighs 15 pounds (6.8 kg). His body condition score is around 6-1/2, and his ideal weight is 12 pounds. In canned food terms, this is between 1 and 3 cans per day. For dry food, this may be anywhere from 1 cup per day to only 1/3 cup per day! This is why knowing the caloric content of the food is so important! Many’s the obese cat I’ve seen whose guardians were feeding a whole cup of dry food per day. This way too much of most dry foods, which are highly concentrated calorie sources, full of fattening carbohydrates and not enough moisture. For cats and dogs, high protein, low carb wet food (canned, homemade, raw, fresh, or reconstituted freeze-dried) is the key to healthy weight–which is, of course, the key to health and longevity!